Corn-Crust Pizza (cheese-less) cooked on pizza stone with homemade tomato sauce, green chilies, onions, mushrooms. jalapenos, and black olives. While it would be ideal to have a crust made exclusively from corn meal, the problem is that corn meal does not possess gluten and will not “behave” (that is, rise) like regular flour crust. This is why most recipes for “corn meal crust” have flour as the prominent ingredient. You can use a pure polenta crust without adding flour. 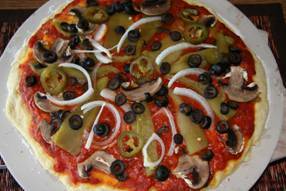 Prepare grits and add cheese to the mix, then spread evenly onto a pizza pan or stone and allow to cool for one hour. Add toppings and bake. This recipe uses flour and gluten in the crust mixture. The less flour you use, the crispier and more delicate the crust. You may need to eat the pizza with a fork instead of holding it. Mix warm water (110-115 degrees) with yeast and honey and wait until it foams...about five minutes. Add flour nd cornmeal, garlic salt and knead for ten minutes on a floured board until smooth. PLace in a greased bowl in a warm place for one hour (or less if very warm). Put on your toppings, adding the tomato base first. Bake in 350 degree oven for about 20 minutes OR 400 degrees for 12-15 minutes (or until the crust is browned).